A Review for Jackson Artist Lure. I was looking for a different lure that must be sparkling and I can retrieve so fast to attract all kind of species especially right before sunrise and after sunset. It also should not rattling. Because places I usually go for spinning are rather rocky shores where it suddenly gets deeper and the big pieces of rocks lay at the bottom and most of those predatory ones hang around them and they attack their victims senselessly if something swims around them so fast. They are not much attracted to any kind of sound. They just want something getting wild like themselves. So, when I saw this beautifully designed sinking hard bait on Jackson Lure website, I knew it was what exactly I have been looking for! It looks so simple but when you handle it, it feels so different. 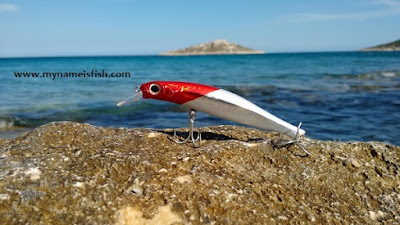 Unique shape of tail, perfectly shaped lip, huge dark eyes in red head and super-shiny body makes Jackson Artist FR 105 absolutely perfect for my needs. It's 105mm, Sinking, 15g and made in Japan. What makes Jackson Artist Lure so special? Easy casting, perfect weight, ultra-fast retrieve or dead-slow retrieve, both ways give you huge confident and excitement. What did you catch with Artist FR 105? Those big beautiful eyes make it look so alive and energetic that provokes all the speed loving predators.